BUSINESS DIRECTORY OF ST. JOHN'S CHURCH We are very grateful to those Contributors who have made the publication of this Bulletin possible. We will, however, need more such friends in order to keep it in successful operation during the whole year. 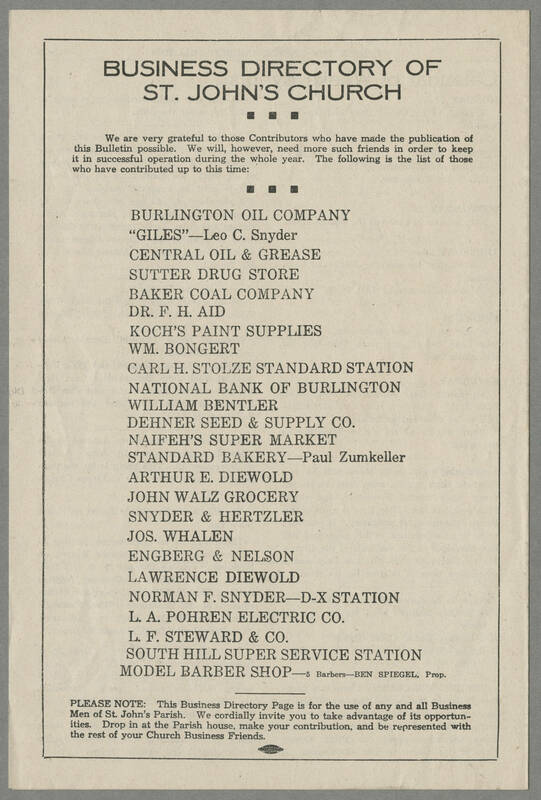 The following is the list of those who have contributed up to this time: BURLINGTON OIL COMPANY "GILES"--Leo C. Snyder CENTRAL OIL & GREASE SUTTER DRUG STORE BAKER COAL COMPANY DR. F. H. AID KOCH'S PAINT SUPPLIES WM. BONGERT CARL H. STOLZE STANDARD STATION NATIONAL BANK OF BURLINGTON WILLIAM BENTLER DEHNER SEED & SUPPLY CO. NAIFEH'S SUPER MARKET STANDARD BAKERY -- Paul Zumkeller ARTHUR E. DIEWOLD JOHN WALZ GROCERY SNYDER & HERTZLER JOS. WHALEN ENGBERG & NELSON LAWRENCE DIEWOLD NORMAN F. SNYDER--D-X STATION L. A. POHREN ELECTRIC CO. L. F. STEWARD & CO SOUTH HILL SUPER SERVICE STATION MODEL BARBER SHOP--5 Barbers--BEN SPIEGEL, Prop. PLEASE NOTE: This Business Directory Page is for the use of any and all Business Men of St. John's Parish. We cordially invite you to take advantage of its opportunities. Drop in at the Parish house, make your contribution, and be represented with the rest of your Church Business Friends.